Follow along for tips and insight on Tiny Living, Positive-Dog training, parenting, and minimalistic living! It's been weeks since I've blogged. I've let so many memories, stories, moments and emotions pass by without documenting it all the way I wanted. I have shared a lot of photographs but even that has been dwindling. I'm feeling fatigued, but I am still moving forward each day at a time. The build has carried on and the tiny has started looking more like a home! A really fun and fantastic new development is that Midwest Tiny Living has asked me to join their team (it was a team of 1) as their Project Manager and Consultant! I've been taking over the majority of client communications and have been helping to guide our next clients through their tiny house journey with Midwest Tiny Living! It has been so fun to help others within the tiny house movement and my 5 years of preparation and forethought into my design is really helping others to envision their very own dream tiny home! Ryan and I will be heading to Midwest Tiny Fest next weekend to really explore the local midwest tiny house community. The festival is taking place in Iowa, and they say it's where the tiny house movement began! 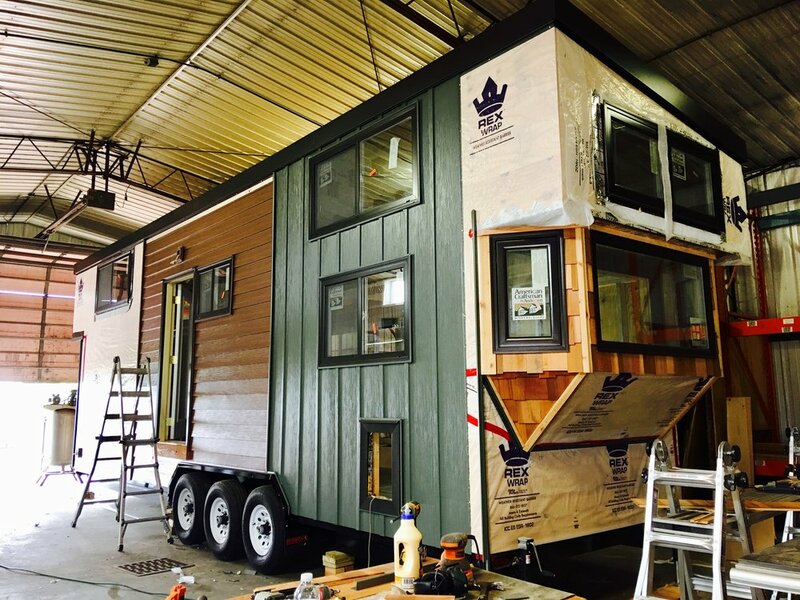 Jay Shafer, the man who is well known in the community as the man who built the very first tiny house on wheels will be speaking and we will get to attend his talk, as well as many other midwest tiny house dwellers and builders. Kim Kasl will also be speaking which will be a joy to finally meet her and gain more of her insight on minimalism and tiny living! She is a local Minnesotan whose family has really blossomed in their Minnesotan lake front property tiny house dream. She has already been so supportive, reaching out to me on Facebook and privately messaging with me to keep me motivated and encouraged. She has never let my mind and spirit drift from what tiny living is really all about! I also have an interesting twist of fate unfolding currently that I am waiting a little longer to reveal any information about. I'm giving The Universe sometime to show me how it's going to work out before I can really say what will come of it so stay tuned for more updates on that as well as the build. I will be at the shop this Sunday sun up to sun down working to get walls, floors and ceilings in. I could certainly use some helping hands so shout out if you're willing! Right off the bat, I just have to say that Midwest Tiny Living is amazing! The quality of their work is outstanding and their speed is incredible! I'm so impressed by how quickly things have been moving along since the build really began. The first floor framing of the house is completed and They quickly began installing Elliott's floor! Elliott and I went to the shop to check out the progress last week and it was so surreal to be standing within walls of my home! I can begin installing insulation next week which is so quick I can't believe it! I feel like I need to recruit help or something! So exciting!! I finally saw the trailer! I came, I saw, I touched, I hugged. It is in fact real and does exist in the physical world! I had such a blast hanging out with Matt and Ryan and having a little photoshoot with the trailer! I have viewed so many other "here's my trailer" photos that it's surreal to be posting my own! So here it is, my custom built, 30ft tiny house trailer! It's just shy of 4 weeks since manufacturing began on my custom 30ft, triple axel trailer and it was delivered to Midwest Tiny Living yesterday! There were a lot of disappointing delays with the manufacturing process that has left somewhat of a bad taste in my mouth about the trailer manufacturer but the owner of the company took full responsibility for the delays and poor communication. We were given an original completion date of May 15th. Obviously, that didn't happen. At this point, I'm just thrilled to have my trailer delivered to my builder Ryan. It's been an emotional rollercoaster already, considering I've made 3 "mortgage" payments on a house that hasn't existed in any physical way. I can't express how excited I am to TOUCH my trailer and reassure myself that it IS real! As involved as I have been in this project, I have to say, it really hasn't hit me that this crazy dream I've had for almost 5 years is actually becoming my real life. I've watched the shows, I've read so many stories of other's tiny house journey that it's weird to actually be writing, photographing, documenting and sharing my own now. I hope that there are others out there who see my story and are inspired by it in the same way I have been following so many others. I love the Tiny House Community and all the amazing connections with people I have made just through the internet! I look forward to continuing to grow #mytinytribe ! Well, it has felt like an eternity, but the day has finally arrived. Midsota Manufacturing begins building my trailer today! After years of dreaming and planning, it's difficult to believe that today marks the day that my tiny house actually exists in some way in the physical world. Making two house payments so far on a home that doesn't exist has been a little nerve wrecking, but it's all apart of #mytinyjourney and I embrace it! The plan is to go check out the progress next Monday which is also my 30th birthday! This year I would say marks a significant step in my journey and I find it very fitting that I'll be able to see and touch the foundation of my home on my birthday. I am ready to take my 30's on and I couldn't be more thrilled to be doing it tiny. With summer upon us, it's tiny house festival season and so I decided to finally make some business cards! I am beyond excited to be able to start handing these out to people who are interested in following along on #mytinyjourney ! I meet a lot of new people and so many are intrigued with the idea of living tiny and rarely encounter someone who actually does. Well, #tinyhousepeoplearereal !! Thank you again to everyone who has supported me along the way! Let the build begin!